(He’s the lovely guy patiently answering the same question for the 6th time in a row in the picture above). Pedro Duarte is Head of Customer Marketing in-home at Unilever Portugal. Pedro has an impressive 15-year of professional experience mainly at Diageo and Unilever. At Unilever Portugal, he is on the ambitious mission of winning shoppers across channels and clients. “Everywhere, everyday!”. Yes, Sir! A couple of months ago, Cécile and I had the great pleasure to travel to the beautiful city of Lisbon to interview Pedro, as one of our long-time clients. We were extended the best possible welcome, as only the Portuguese can do (disclaimer: I am married to a Portuguese). We talked about Portuguese cheese, hidden cocktail bars in Paris, doing an MBA in Singapore, and Retail Execution. A lot. At Unilever, they are really serious about Retail Execution. Back in the late 2000s, they were one of the first companies to initiate a Perfect Store initiative and roll it out at a global level. In a Unilever Perfect Store, the relevant assortment is available and visible to shoppers because it has been correctly merchandised and correctly placed based on shopper insights. In addition, proper in-store tools and communication are in place to close the sales. As a result, Perfect Store execution provides for improved business performance and outstanding growth. “A simple enough concept” as would say Paul Polman, who retired last month after 10 years as Unilever CEO. “But implementing these Perfect Stores with speed and rigor takes discipline” (Unilever 2010 Q3 result speech). Which starts with being able to measure store compliance and performance. That’s where Planorama comes in. At Unilever, our solution has a little nickname: they call it DM, for Digital Measurement. Unilever Portugal was precisely one of the very first Unilever markets to roll out Planorama as their image recognition solution to track store performance and monitor planogram compliance. But let’s be honest, at first, it did not look like it would be an easy ride. As Pedro explained in preparation of our interview: “It was a challenge in the beginning because, before Planorama, we were relying on manual store checks performed by external auditors.” They decided to stop manual store checks and instead, asked their sales reps to start doing digital store checks using Planorama. “This was an additional responsibility for our sales reps. On top of what they already had to do.” Despite what could have been considered a difficulty by many, Unilever Portugal decided to go all in with DM. From day 1. And the numbers proved they were right to do so. 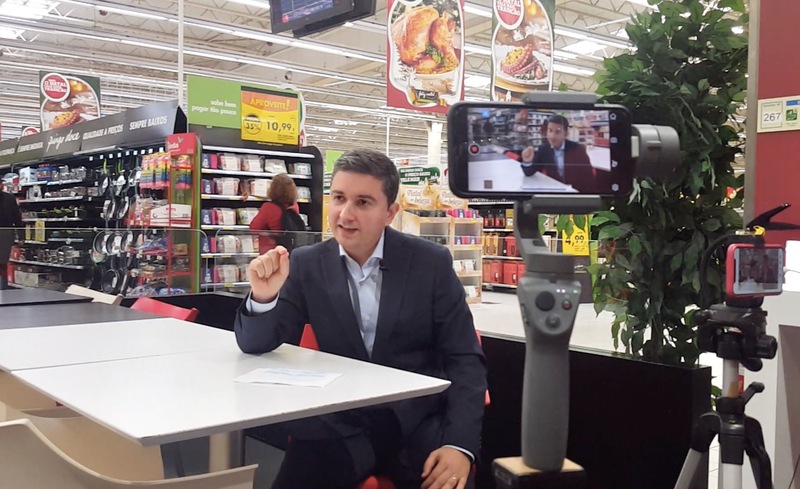 Interested in following the footsteps of Unilever Portugal and using Image Recognition to transform your retail execution? Let's have a chat. Cannot watch the video in the open space? I’ve also transcribed the full interview, which you can read below. Planorama: Who are you, Pedro Duarte? Pedro: Hi, I’m Pedro Duarte. Head of Customer Marketing In-Home for Unilever Portugal. In customer marketing, we are responsible for designing category management projects and shopper marketing initiatives. Basically, we are the gate-keepers of perfect execution. Planorama: How did the IR project start for you? Pedro: It started as part of the perfect store initiative, it was this global project at Unilever, started in 2013. And Portugal was one of the first markets to roll out the Planorama solution. At that time, we had external auditors who did manual store checks. We stopped the external audits, we onboarded all the sales reps into Digital Measurement since day 1. Planorama: What did you want to achieve with this project? Pedro: Of course, it was all about perfect execution. But what I wanted was to instill the idea of the founder’s mentality: each person owns a part of the company and is responsible and accountable for its results. But the biggest change in terms of culture was for the sales reps. Imagine yourself being a sales rep, you go to a store, you do your work, you take a photo, and you get a number for that. Don’t get me wrong, we did not want to police sales reps. It was the other way around. We want them to become better at what they are doing. So we needed a tool for that, to implement a Perfect Store execution culture. That’s why we use Planorama. Planorama: What is the scope of DM in Portugal now? Pedro: We have a field force of 28 sales reps, both internal and external, there to audit each month one store. We audit a total of 320 stores. In total, they cover 12 categories. On average it takes more or less 3 minutes per category to take all the pictures required, from 20 seconds for soups to 5 minutes for ice creams. We monitor more than 16 KPIs, including OSA, SOS, NPD, Secondary placements, and also Permanent visibility. In my department, I have one perfect store assistant. His role is to manage image database, to check the photos, to talk with the reps to understand if there is any issue with the app, and to manage the relationship with Planorama. And that’s it! Planorama: Which benefits have you experienced? Pedro: We had an immediate benefit, we had cost savings. We stopped using external audits and we reduced our audit costs by 80%. Plus, we increased the audited store coverage by 60%. And we also observed higher accuracy in the results, because in the long run a machine gives you better results than a person, because it’s never tired. Planorama: How do you use the Planorama data? Pedro: First of all, it’s a self-assessment tool for sales reps. They can evaluate their results against their targets and also instigate conversations with store managers. In the headquarters, catmans can spot non-compliant stores and allocate merchandisers to those stores to do the replenishment. In addition, during our sales cycle meetings, we share the results with catmans and sales people. Everyone gets the same level of information. This is very important because sales reps get their bonuses calculated from the Planorama data. It’s embedded in the organization and processes. At the retailer level, we use the information to collaborate in category management projects. And for myself, I track my results versus last year, versus last month, which is very important for us to keep the track on perfect execution. Pedro: Overall, it’s a continuous process to perfection. If we stop digital measurement now, we will lose a lot to the future. This is like a sailing competition. Searching for the Perfect Store, getting the Perfect Store, it’s like sailing: you have to correct your position against the wind to navigate faster and faster. Pedro (reading the question): if you had a superpower, what would it be? Pedro (reading the question): if you were a Unilever product, what would it be? Pedro (reading the question): who is your favorite vendor? PS: Join thousands of your peers. Subscribe to Planorama Retail tech blog. Every time we have a new blog post out, we’ll send you a short email notification about it. Our team at Planorama works hard to produce insightful articles for you. And we also team up with the best retail industry experts to share with you the latest trends about retail execution and merchandising. So Subscribe now.